You people just don’t stop, do you? 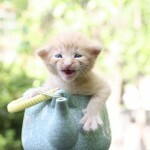 First it was cute kitties in teapots then oversized teacups and now tea mugs? 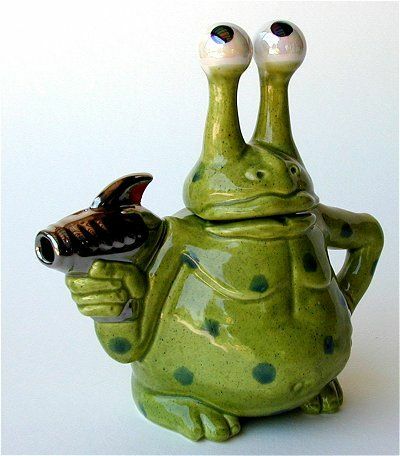 It would go SO WELL with my dinosaur creamer! 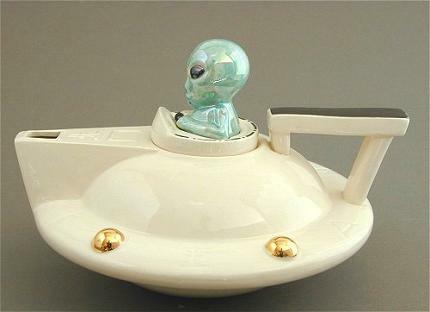 There are more space-themed teapots here, my favorite being Take Me To Your Leader. Even the name makes me smile. Joanne Linder emailed me about her Etsy shop, Vintage Twee, for “an enchantingly English range of hand crafted décor for the loveliest tea party, wedding or shower” and I had to have a peek. Oh, the lovelies! See? See? See? You manly tea-drinking men may find this all a little too frilly for your tastes but HEY, you already have WOLVERINE so jut leave us ladies some leeway with the pretties, ‘kay? 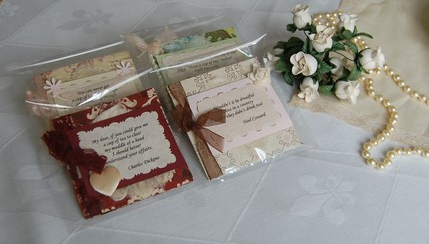 Seriously though, I love the fact that these are all hand-made with such a romantic Victorian flair. 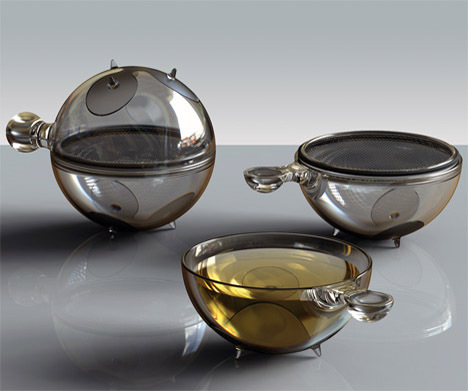 It’s homey, cozy, and couldn’t you see them paired with this heart-shaped tea set from Wagokoro-Ya? 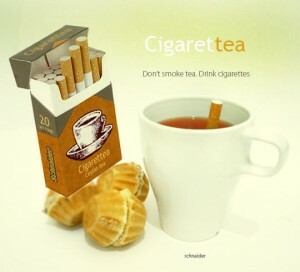 The origami tea bags are lovely, I’ve used the side-arm tea bags and the pyramid tea bags before (that’s another blog post someday), the hanger tea bags are terribly cute and I must acquire some, but I’m not sure how I feel about the the cigarette tea bags. 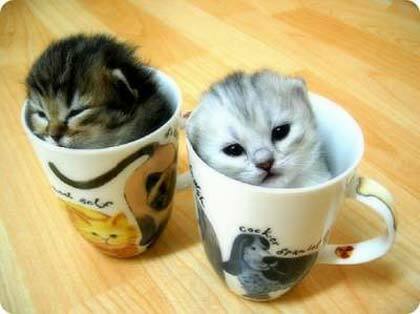 I’ll take mine with cream and sugar – to go, please. Great Google’s grandmother, I haven’t updated here in a while! Too busy drinking tea I guess. Seriously, I’ve been hoarding lots of delicious tidbits for a while now, but I’ve been too swamped to share them. Until now. 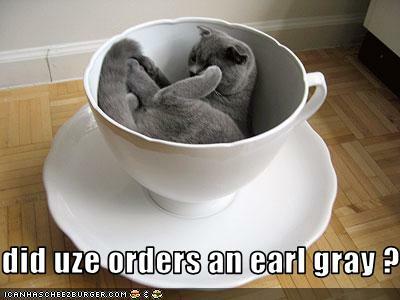 Never fear, I’m still crazy for tea and happily pushing the stuff onto my friends. 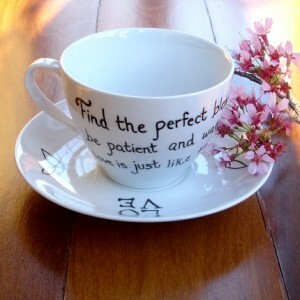 These tranquil cups are hand painted, dishwasher and microwave safe. Custom cups can be created for that special occasion. You can almost feel the “ahhhhhhh“. 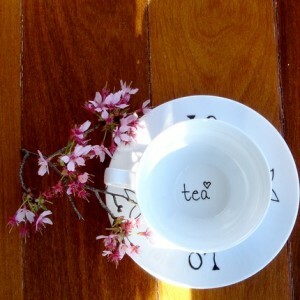 Do you throw away that used teabag as soon as you’re done with it? Not the artisans in a small settlement located in Mandela Park, just outside of Cape Town in South Africa. Instead, they’ve turned used teabags into works of art by turning the bags into tiny canvases. First they dry the teabags in the sun, then empty them of leaves and iron them before painstakingly painting them in stunning African designs. Original TBag Designs is a collective of artists who live in an informal settlement in Hout Bay, South Africa. With recycled tea bags as their canvases they are painting themselves out of poverty. The group gathers together to assemble the finished products: greeting cards, notepads, journals, ornaments, candles, coasters, trinket boxes, and tea light holders. They’ll make special designs by request, but ordinarily they just paint “what is in our heads”. The original group of ladies have become skilled and talented artists. T-Bags now employs 15 permanent staff and a number of additional employees work part-time. In addition, 10 people with disabilities from within the community are employed to assist with sanding products. Their workshop is a tourist destination and they sell their products at the workshop, at Cape Town’s Waterfront Market, and in Europe and the United States. The selection of items includes everything from magnets, coasters and bookmarks, to wine bags, trays and mirrors. That is all. 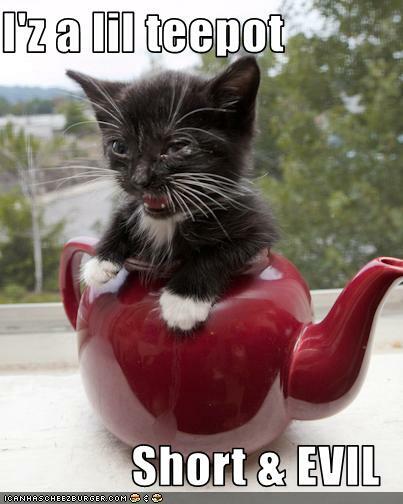 I’m off to find more pictures of impossibly adorable creatures in teacups and teapots.